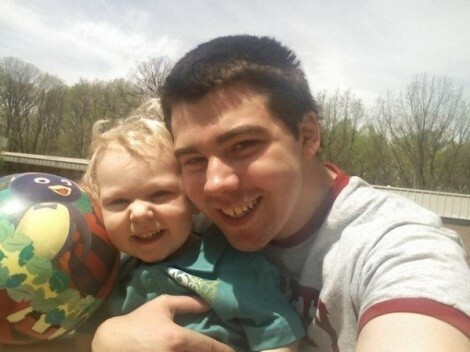 The Salt Lake Tribune gave A1 real estate to the story of John Wyatt's in today's paper, more than a month after my cover story, "Some Call it Kidnapping," which featured Wyatt (pictured at right with his nephew) and several other fathers' stories of battling Utah's adoption laws from their homes in other states. What I established in the story is that several times each year, a mother who is unable to place her baby for adoption in her home state because the baby's father objects finds her way to Utah where many legal observers' both inside Utah and elsewhere say the laws are tilted against the fathers more than in any other state. "Several times each year," may not sound like that much, but when you listen to the fathers moan about missing their baby they've never met--and their mothers who miss their grandchild that they've never met--it starts to sound all too frequent. For those who lack sympathy for the fathers--you're entitled--also keep in mind that years-long litigation is gut-wrenching and expensive for the adoptive family and it tarnishes the image of adoption in general. Here's the real kicker: when/if these fathers do prevail, it's because they've successfully argued that their Constitutional rights to their child--yes, fathers have some--were violated and at that point, it's only a matter of law free from the best interests of the child which determines where the child should live. More simply, if the dad wins, the poor tot is moved from the adoptive family--the only one he's ever known--to an almost inevitable custody battle between the biological parents, and nobody likes that. The Wyatt case is a good one for the Tribune to single out from the rest. His attorney is making a novel argument, that A Act of Love Adoptions and the adoptive parents violated the federal Parental Kidnapping Prevention Act by over-stepping Wyatt in Virginia and using Utah law--from a hotel room in Virginia--to cut him out. I won't recap the legal nitty-gritty, but for more, just read "Some Call it Kidnapping." In Utah, these fathers almost never win, so it's interesting to see an attorney try a new legal tactic. The president-elect of the Utah Adoption Council has a novel legal argument of his own in an adoption case poised to cause quite a stir as it matures. His client, Michael Duane Hunter, of Washington state, accuses the mother of his child, the adoption agency and several others of a criminal conspiracy. They conspired, attorney Wes Hutchins argues, "for the sole purpose of getting around laws that otherwise apply to the placement of a Minor Child in Washington ... which would have required defendants to provide Hunter with notice of and an opportunity to object to any attempted placement of the Minor Child for adoption." (page 34). Hutchins cites the Racketeering Influenced and Corrupt Organization Act--a law setup to take down the Mob--as the basis for the complaint. Put another way, he's accusing a Utah adoption agency of being at the center of an organized criminal syndicate. Heavy stuff.